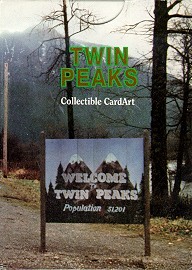 In 1991, Star Pics issued a series of Twin Peaks trading cards. Some boxed sets of all the cards even contained a signed card by one of the Twin Peaks actors. *Note: Some of the cards contain factual errors. For instance, card 67 says Windom Earle is being sent to Twin Peaks to conduct the FBI investigation on Cooper. But of course, it was Dennis/Denise Bryson. The information is presented here exactly as it is listed on the cards. But take it with a grain of salt. "I'm going to have the world's..."
"Maybe that's all BOB is..."
"Local legend. The White Lodge..."
"DON'T LET 'EM RATTLE YOU..."